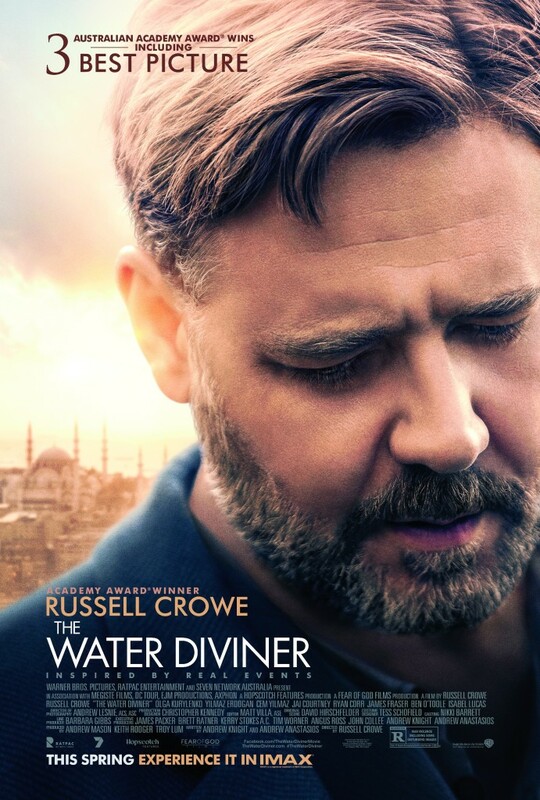 The Water Diviner marks a fine debut directing effort for Russell Crowe, who also leads an exceptional international cast in this inspired-by-true-events war drama, set primarily in post-World War I Turkey. While the film’s editing and pacing is at times problematic, its stunning cinematography and attention to detail in terms of production design, when considered along with the work of the cast and the overall director’s vision, more than makes up for any storytelling shortcomings. Crowe plays Joshua Connor, a lifelong farmer living in the Australian Outback in 1919. Joshua has been able to eek out a relatively prosperous existence for himself and his family thanks to his talent for “water divining” — finding pockets of rainwater collected in aquifers buried deep beneath the Outback’s arid terrain. Four years earlier, he and his wife Eliza (Jacqueline McKenzie) received word that all three of their sons, who had heeded the patriotic call to enlist along with hundreds of thousands of native Australians to fight in what would come to be known as World War I, lost their lives in Turkey, in the bloody 8-month-long Gallipoli campaign. Her mind and spirit broken by the loss of her children and the inability of the Commonwealth’s government and military to return their bodies home from the battlefield, Eliza takes her own life, leaving Joshua alone to grieve for them all. Kneeling at her grave, he promises to somehow find the boys and bring them home. As the search grows more complicated, Joshua finds unlikely allies in Hasan and Jemal, and also in Ayshe (Olga Kurylenko), the wife of a Turkish soldier also lost and presumed dead at Gallipoli, and her young son Ohman (Dylan Georgiades). It’s through the eyes of these people, all scarred in their own ways by the war that claimed his sons, that Joshua comes to see the conflict and their world in a way he never expected to. That perspective, along with his own instincts and deeply-rooted connection to his boys, allows him to take each progressively more dangerous step toward discovering their true fates, and at last finding some measure of peace. Considering the directors that Crowe has had the opportunity to pick up a trick or two from as he’s worked with them throughout his career — Ridley Scott, Michael Mann, Ron Howard, etc. — it should come as no surprise that he acquits himself well in terms of the particular directorial challenge of framing large scale action on screen. The Water Diviner’s handful of scenes depicting the horrors of the battle at Gallipoli, characterized by the claustrophobic chaos of trench warfare and fighting at times waged in darkness at point blank range, are appropriately mesmerizing and harrowing at the same time. 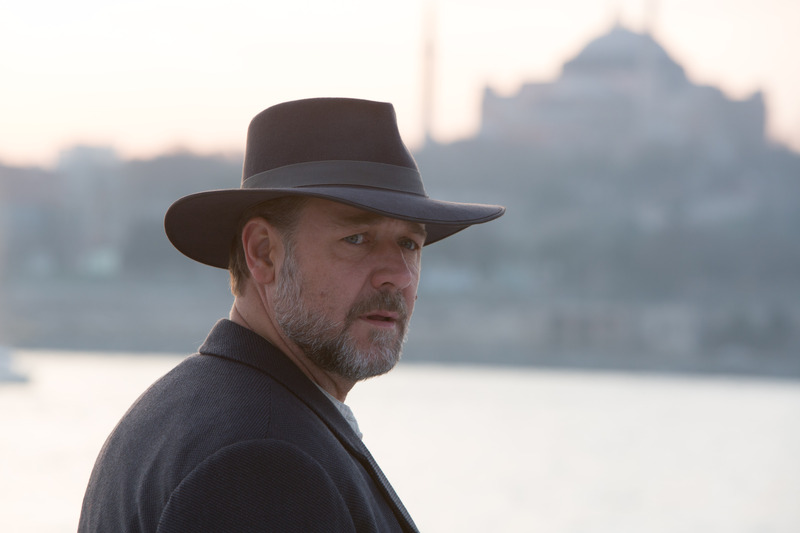 What may come as a surprise to audiences is just how well Crowe brings to life quieter scenes, especially those that showcase the beauty and splendor of the exotic locales in which the story takes place. Aided in this task by Oscar-winning director of photography Andrew Lesnie (The Lord of the Rings and The Hobbit trilogies), the film grants audiences a truly unique visual tour of Turkey, including a stunning glimpse inside Istanbul’s historic Blue Mosque, the interiors of which have never been allowed to be filmed by Westerners prior to this film. The sights and sounds captured in all theses scenes contribute to an almost-unshakable sense of authenticity as the film progresses. The film’s story may at times veer toward the implausibility found in big budget films, but the setting around it never does, and that’s a testament to the skill and care put into the production by Crowe and his crew. What may also surprise audiences is that Crowe, though he of course has top billing in the film’s credits and appears in just about all of the film’s scenes, is not the true featured performer here. In addition to the setting itself coming to life as a character of sorts in the film, it’s the actors playing supporting roles that shine the brightest as the film moves into its second and third act. Those familiar at all with Turkish cinema perhaps won’t be surprised to encounter the memorable and moving work turned in here by Yilmaz Erdoğan and Cem Yilmaz, two of Turkey’s most acclaimed cinematic performers. (No shame if that’s not you — it’s not this critic, either.) Olga Kurylenko, perhaps best known to Western audiences for her work in genre films such as The November Man, Oblivion, and Quantum of Solace, also makes the most of the opportunity to play a very different type of role, and delivers a standout effort which one might hope will bring her to the attention of casting directors looking to fill more of these types of roles. That’s not to say that Crowe’s work in front of the camera is in any way unequal to that of his cast — far from it. It’s just that we’ve simply come to expect excellence from him, especially when he takes on roles requiring a quiet yet palpable strength and charisma, which is what he’s all about here. If there are “negatives” to be found in The Water Diviner, they might be in the film’s pacing and editing. Too often in the film montages are utilized to compress time and convey in visual shorthand moments that could have had more emotional resonance had they been given more room to breathe; the relationship that develops between Joshua and Ayshe in particular suffers a bit from this. At 111 minutes, the film is actually surprisingly short considering the epic scope of the production, and so a few more minutes here and there spent further exploring the moments that get glossed over might have served the film well. Undeniably, the film’s denouement also moves slightly toward Hallmark movie territory in terms of how things work out; a little more heft to the moments relegated to montage form might have helped balance the weight of that sentimentality, too. But again, the positives certainly outweigh any negatives one might quibble over. As we approach the cinematic season of big budget bombast and style over substance, it’s important to get out and see films like The Water Diviner before they disappear. In the case of this film in particular, it’s highly doubtful you’ll be disappointed. Starring Russell Crowe, Olga Kurylenko, Yilmaz Erdoğan, Cem Yilmaz, Jai Courtney, Ryan Corr, James Fraser, Ben O’Toole, Steve Bastoni, Dylan Georgiades, Jacqueline McKenzie and Isabel Lucas. Directed by Russell Crowe. Rated R for war violence including some disturbing images.